Multiple sclerosis (MS) is a demyelinating disease in the central nervous system, as accompanied by various clinical symptoms in different stages, including balance problems, weakness, blurred vision, muscle weakness, fatigue, and dizziness. Initial symptoms are commonly one or more as follows: diminished dexterity, monocular visual loss, double vision (diplopia), ataxia, gait instability. With the disease progression, bladder dysfunctions, fatigue, heat sensitivity will happen in common. Impaired attention, memory loss, problem solving difficulties will occur at the advanced stage, and especially, 60% patients can experience depression (Hauser and Oksenberg, 2006). Nowadays, it brings about heavy social and economic burdens (Farjam et al., 2015). MS is a noteworthy physical and cognitive disability that usually affects young adults (Goris et al., 2012). MS belongs to a multifactorial disorder, due to the interaction of environmental and genetic factors (Hoffjan and Akkad, 2010). The shared genetic factors mainly include increased familial risk, half and step siblings, rather than lifestyle factors (Ebers et al., 1995, 2004; Dyment et al., 2006). Environmental factors associated with MS incidence include childhood obesity, low vitamin D level, Epstein Barr Virus infection, smoking (Housley et al., 2015). MS exhibits a relatively high incidence in high latitude regions and northern European populations (1/400), which affects over 2.5 million people (2 to 160/100,000) worldwide and approximately 4,00,000 people from USA (Compston and Coles, 2008). Genome-wide association studies have identified over 100 variant genes associated with this disease (Ingram et al., 2009). therefore, MS is classified into the four subtypes: (1) primary progressive MS (PPMS); (2) relapsing-remitting MS (RRMS); (3) secondary-progressive MS (SPMS); and (4) progressive-relapsing MS (PRMS). PPMS is characterized by steady, constantly developing symptoms with minor attacks, and RRMS defined by clear attacks of new or increasing neurologic dysfunctions. With the progression of RRMS, SPMS is likely to occur with continuous symptoms. PRMS refers to a pattern of relapses within PPMS, defined as steadily worsening neurologic function. Almost 85% of MS patients have the relapsing-remitting form of MS, and approximately half of them will progress to SPMS (Raphael et al., 2015). In addition, 20% of MS patients are diagnosed with PPMS (Witte et al., 2014). Numerous studies have been done on interleukin 7 receptor alpha chain (IL7RA), interleukin 2 receptor alpha chain (IL2RA), CD58 genes and mitochondrial DNA in MS. Here, we review the results of significant single nucleotide polymorphisms (SNPs) in those genes in different cohorts. Because SNP is a genetic marker in divergent population studies, as well as a successful marker tool for different diseases, such as type 1 diabetes mellitus, Crohn's disease and systemic lupus erythematosus (Ogura et al., 2001; Prokunina et al., 2002; Florez et al., 2003). Interleukin 7 (IL-7) is a tissue-derived cytokine, monomer in structure, which has a 25 kDa molecular weight, total weight of 152 amino acids. It is produced by stromal tissues, epithelial cells in the thymus and bone marrow, including B cells, monocytes, keratinocytes. IL-7 contributes to the proliferation and development of B cells and T cells. Target cells of IL-7 are developing B and T lymphocytes, mature T cells, and NK cells (Fry and Mackall, 2002). IL-7 is expressed in lymphoid cells during cell development and maturation. IL-7 has two receptors, respectively, IL7R and soluble IL7R. IL7R consists of two receptor chains, the IL7RA (also known as CD127) and the common gamma chain (CD132) (Hofmeister et al., 1999). IL7RA belongs to type I cytokine receptor family that is encoded by the IL7RA gene (Akdis et al., 2011). IL7R gene is a SNP on chromosome 5p13 that exerts some vital roles in development, maturation, and homeostasis of T and B cells in the immune system (Fry and Mackall, 2002). Approximately 30 years later, IL7RA was identified as the initial non-major histocompatibility complex (non MHC) in MS susceptibility loci in different populations (Zuvich et al., 2010). Studies have shown IL7RA as a susceptible gene for MS (Weber et al., 2008; Baranzini et al., 2009; Kallio et al., 2009; Sombekke et al., 2011). IL7RA gene has been shown to be associated with MS in different cohort studies reported from 1999 till today. Booth et al. (2005) showed that rs6897932 leads to the exon 6 skipping in IL7RA, finally resulting in the augment in the production of soluble form of IL7Rα for the persons who having the risk allele. But rs11567686 might manipulate the expression of IL7Rα (Haj et al., 2015). SNP rs11567686 and SNP rs11567685 located in 449 bp and 504 bp from start codon on the promoter of IL7RA gene illustrated optimistic association with MS, which has been already reported. The studies clarified that three SNPs in IL7RA gene can influence the expression of this disease (Booth et al., 2005). Teutsch et al. (2003) was found DRB1*1501-positive in MS patients, and identified 11 novel SNPs, however, with no statistical significance. A study by Zhang et al. (2005) recruited 672 MS patients and 672 controls, in which, 66 genes identified for 123 SNPs. On the basis of regions related to other autoimmune diseases, chromosomes 5, 7, 12, 17, 19 were selected (Becker et al., 1998; Oksenberg et al., 2001). rs987107, rs987106, rs3194051 from IL7R showed a moderate risk in the immune system in MS patients (Zhang et al., 2005). Gregory et al. (2007) confirmed rs987106 in intron 6 was a bit significant for the initiation of previous study from IL7R, and they found rs6897932 was significant in the IL7RA gene. However, they proved rs6897932 determined by the functional effect in MS patients. Zuvich et al. (2010) studied 2,961 samples (1,479 cases and 1,482 controls), even though one SNP in IL7 (rs2587156) came close (P value = 2.46 × 10-5 ). Interestingly, the reported rs6897932 in IL7RA, having the risk allele C, is actually less common in Australian MS patients (0.751) than controls (0.758) (Rubio et al., 2008). But association with rs6897932 in the IL7RA gene is likely to induce the susceptibility of the disease (Zuvich et al., 2010). However, rs6897932 indicates the strongest association among different SNPs in IL7RA through divergent cohorts (Teutsch et al., 2003; Zhang et al., 2005; Gregory et al., 2007; Lundmark et al., 2007; Ramagopalan et al., 2007; Alcina et al., 2008; Akkad et al., 2009). Gillis and Smith (1977) and Morgan et al. (1976) showed the proliferation of antigen-activated T cells was induced by the activated T cells, which contain mediators in culture media. Kasakura and Lowenstein (1965) and Gordon and MacLean (1965) found a soluble mitogenic factor in the culture media. In the following years, it had become clear, that a single protein was accountable for this cause, and that factor was called as interleukin-2 (IL-2). IL-2 is a monomer that contains 133 amino acids with a weight of 15.5 kDa (Wang et al., 2009). It can bind to the IL-2R, whose function in autoimmunity control is consistent (Cavanillas et al., 2010). The IL2R contains three subunits: IL-2Ralpha, IL-2Rbeta, and the common gamma-chain. Il-2Ralpha contains two sushi domains (Malek, 2008). Studies from Rubio et al. (2008) showed rs2104286 in IL2RA gene in chromosome 10p15, in the first intron, was associated with MS. In the Australian population, three genes were selected for the study, KIAA0350, IL2RA and CD58. Among 42 SNPs passing in the IL2RA gene, rs12722605 and rs791589 were nominally associated with the MS (Perera et al., 2009). Cavanillas et al. (2010) genotyped some SNPs, but the signal of association was found for rs6822844. Therefore, a similar scenario involving IL-2 in MS risk seems to emerge. A recent study from Ainiding et al. (2014) analyzed rs2104286, rs12722489, rs7090512 in IL2RA gene, in Japanese patients with MS, although IL2RA modified the disease activity of the female MS patients instead of being a genetic risk factor in MS patients. Only few studies concluded the SNP rs2104286, rs12722489 might be MS markers. Weber et al. (2008) showed in the German and French cohorts, MS is associated with SNPs rs12722489, rs2104286 in IL2RA, and rs6897932 in an IL7RA gene in different odds ratios from 1.1 to 1.5. Based on the odds ratio they concluded SNPs in IL2RA and IL7RA, are modest in huge number of divergent studies, and also further perspective studies about these will make a clear path in MS susceptibility locus. In 2007, Genome-Wide Association Studies proved SNP rs12722489 from IL2RA, SNP rs6897932 from IL7RA as susceptible genes in MS (Ramagopalan et al., 2007). In the meantime, another independent replication in a Canadian population exhibited an association of IL2RA with MS susceptibility. Akkad et al. (2009) studied five nucleotide polymorphisms in IL7RA and four in IL2RA gene. But PPMS and SPMS patients only indicate the IL7RA gene polymorphisms. The two SNPs rs12722489 and rs2104286 in intron 1 of IL2RA gene were not clearly associated with MS in this cohort. rs1570538, rs2104286, rs12722489, rs1570538 of IL2RA was previously confirmed to be weakly associated with MS, but with an increased statistical significance in an actual extended cohort study. Additionally, no MS-related significant data were found in rs41295061 and rs12722489 (Alcina et al., 2009). CD58 gene encodes a receptor called CD2 that is present in chromosome 1p13, to modify immune recognition and be involved in contacts between cytolytic effectors to target cells, antigen presenting cells to T helper cells (Wang et al., 1999), for signal transduction as well s differentiation and proliferation of T cell. Given these, CD58 shares a critical role (Deckert et al., 1992). Past studies showed a role for CD58 susceptibility shared by some other autoimmune diseases, such as chronic inflammatory polyneuropathies (Van Rhijn et al., 2000). Risk allele from CD58 leads to less CD58 expression, causing dysfunction of regulatory T cells in MS patients through down-regulation of FoxP3 (Bahreini et al., 2010). The first report from Hafler et al. (2007) by International Multiple Sclerosis Genetics Consortium (IMSGC) showed the association of 14 loci with MS including CD58 gene. Again it is repeated by an Australian cohort study (Rubio et al., 2008). However, the genome wide significance cannot show that relationship (Hoppenbrouwers et al., 2009). SNPs within the first intron of CD58 showing strong linkage disequilibrium are frequently confirmed as genetic markers in MS (De Jager et al., 2009). And rs2300747 is also a best susceptibility allele in the MS patients from the United Kingdom and the United States. In 2007, a study enrolling MS patients from 931 families showed an odd ratio of 1.48 for rs12044852, which is again conformed at replication phase (Hafler et al., 2007). Rubio et al. (2008) found intron 1 of CD58 gene, providing evidence of a predisposing effect for rs12044852. Another genome-wide association study in 2011 reported an odd ratio of 1.37 in SNP rs2300747. Large-scale IMSGC studies in 2011 and 2013 showed the odd ratios for rs1335532 was 1.22 and 1.29, respectively (International Multiple Sclerosis Genetics Consortium et al., 2011; Kemppinen et al., 2011; Patsopoulos et al., 2011). But the rs2300747 polymorphism was found within the first intron of CD58 and did not have a identified efficient consequence (De Jager et al., 2009). The strongest genetic association was seen in rs12044852 (odds ratio = 2.13) with DRB1*15 allele more discriminative patients (Hecker et al., 2014) and interferon-β therapy treatment patients in RRMS stage cases (Torbati et al., 2015). rs12044852 was confirmed in enlarged risk allele frequency, with an odd ratio of 2.63 (D'Netto et al., 2009). Hecker et al. (2014) also studied mRNA levels in vivo, but there were no proper method for prognosis of the MS progression. They also concluded the alternative splicing of CD58, revealing the pathophysiology of MS. These achievements indicated rs12044852 from CD58 locus will be a genetic marker of MS. Most of eukaryotic cells, as well as human body cells contain mitochondria, an intracellular organelle. Their primary function is to perform oxidative phosphorylation to produce adenosine triphosphate (ATP) in cell for energy (Ruiz-Pesini et al., 2007). mtDNA is a double-stranded DNA, circular in shape, maternally inherited, and different from nuclear DNA. mtDNA, in humans, has 16,569 base pairs in length (Andrews et al., 1999). The cell contains 100 to 10,000 mitochondria, and each contains 2-10 copies of mtDNA. The two strands of mitochondrial DNA are termed respectively, the heavy (H-strand) guanine rich and light (L-strand), cytosine rich strand (Wiesner et al., 1992). mtDNA contains 37 genes, 28 as H-strand and 9 as L-strand. The mitochondrial tRNA is encoded by 22 genes, including 13 genes encoding polypeptide components of the mitochondrial respiratory chain, 2 genes encoding a 16s rRNA (large ribosomal subunit), and 1 gene encoding a 12s rRNA (small ribosomal subunit) (Keogh and Chinnery, 2015). High-level mtDNA mutation is one of the most important reasons for MS (Witte et al., 2014). Specific mtDNA background might be a factor for optic nerve damage in MS patients (Penisson-Besnier et al., 2001). The previously identified mtDNA K* haplotype, defined by variants at mtDNA 9055, 10,398 and 14,798, have showed a strong association with MS (Torroni et al., 1996; Kalman et al., 1999). Ban et al. (2008) stated that haplogroup U may be a risk for MS. Haplogroups J, T and X were not particularly associated with MS (Penisson-Besnier et al., 2001). Fourteen mtDNA polymorphisms were studied through the restriction enzyme analysis in the Bulgarian patients who diagnosed with RRMS (Mihailova et al., 2007). The T4216C mutation was positive in 21 out of 58 patients. Given this, base substitution might be a risk factor (Mao and Reddy, 2010). Andalib et al. (2015b) showed no significant statistical difference in the frequency of mtDNAA4917G, mtDNA T4216C variation between the cases and the controls in ND2 gene in the Iranian population. Frequency of G14179A variation in ND6 gene was considerably elevated in the control group compared with the patients, while prevalence of ND1, ND2, ND3, ND4 and ND5 gene variations was considerably elevated in patients than the healthy controls (Poursadegh Zonouzi et al., 2014) (some mtDNA variations shown in [Table 1]). There was no association in G13708A, T14798C mutations and MS (Mihailova et al., 2007). Vogler et al. (2005) found that G866A mtDNA variation in the promoter region, which results in a change in uncoupling protein 2, was related with vulnerability to MS in a German population. During neuronal death and injury as well as ATP synthesis, the UCP2 prevents the proton passing in to the mitochondria. In this study, different two cohorts were analyzed, including 1,097 MS patients. It indicated the G866A variation in mtDNA was related with MS (P = 0.0015). Also, G4298A mutation was shown as a susceptibility gene in MS (Taylor et al., 1998; Andalib et al., 2013). Andalib et al. (2015) showed mtDNA G15257A was found in 1 of 100 patients, but mtDNA G15812A was not found in 1 of 100. Their findings were inconsistent with the hypothesis that tRNA(Thr) gene is associated with MS (Mayr-Wohlfart et al., 1996). Further investigations on rs12044852 from CD58 gene, rs6897932 from IL7RA gene and rs2104286 from IL2RA gene in MS are warranted, as the pathogenesis of MS is unknown until now. The T4216, G11778A and A4917G variation in mitochondrial genes have been repeatedly in different cohorts, without any specific results. Further exploration in different cohorts throughout the world will provide a new insight into the MS treatment. Ainiding G, Kawano Y, Sato S, Isobe N, Matsushita T, Yoshimura S, Yonekawa T, Yamasaki R, Murai H, Kira J, South Japan Multiple Sclerosis Genetics C (2014) Interleukin 2 receptor alpha chain gene polymorphisms and risks of multiple sclerosis and neuromyelitis optica in southern Japanese. J Neurol Sci 337:147-150. Akdis M, Burgler S, Crameri R, Eiwegger T, Fujita H, Gomez E, Klunker S, Meyer N, O′Mahony L, Palomares O, Rhyner C, Ouaked N, Schaffartzik A, Van De Veen W, Zeller S, Zimmermann M, Akdis CA (2011) Interleukins, from 1 to 37, and interferon-gamma: receptors, functions, and roles in diseases. J Allergy Clin Immunol 127:701-721. Akkad DA, Hoffjan S, Petrasch-Parwez E, Beygo J, Gold R, Epplen JT (2009) Variation in the IL7RA and IL2RA genes in German multiple sclerosis patients. J Autoimmun 32:110-115. Alcina A, Fedetz M, Ndagire D, Fernandez O, Leyva L, Guerrero M, Arnal C, Delgado C, Matesanz F (2008) The T244I variant of the interleukin-7 receptor-alpha gene and multiple sclerosis. Tissue Antigens 72:158-161. Alcina A, Fedetz M, Ndagire D, Fernandez O, Leyva L, Guerrero M, Abad-Grau MM, Arnal C, Delgado C, Lucas M, Izquierdo G, Matesanz F (2009) IL2RA/CD25 gene polymorphisms: uneven association with multiple sclerosis (MS) and type 1 diabetes (T1D). PLoS One 4:e4137. Andalib S, Talebi M, Sakhinia E, Farhoudi M, Sadeghi-Bazargani H, Gjedde A (2015a) Lack of association between mitochondrial DNA G15257A and G15812A variations and multiple sclerosis. J Neurol Sci 356:102-106. Andalib S, Talebi M, Sakhinia E, Farhoudi M, Sadeghi-Bazargani H, Gjedde A (2015b) Mitochondrial DNA T4216C and A4917G variations in multiple sclerosis. J Neurol Sci 356:55-60. Andalib S, Talebi M, Sakhinia E, Farhoudi M, Sadeghi-Bazargani H, Motavallian A, Pilehvar-Soltanahmadi Y (2013) Multiple sclerosis and mitochondrial gene variations: a review. J Neurol Sci 330:10-15. Andrews RM, Kubacka I, Chinnery PF, Lightowlers RN, Turnbull DM, Howell N (1999) Reanalysis and revision of the Cambridge reference sequence for human mitochondrial DNA. Nat Genet 23:147. Bahreini SA, Jabalameli MR, Saadatnia M, Zahednasab H (2010) The role of non-HLA single nucleotide polymorphisms in multiple sclerosis susceptibility. J Neuroimmunol 229:5-15. Ban M, Elson J, Walton A, Turnbull D, Compston A, Chinnery P, Sawcer S (2008) Investigation of the role of mitochondrial DNA in multiple sclerosis susceptibility. PLoS One 3:e2891. Baranzini SE1, Wang J, Gibson RA, Galwey N, Naegelin Y, Barkhof F, Radue EW, Lindberg RL, Uitdehaag BM, Johnson MR, Angelakopoulou A, Hall L, Richardson JC, Prinjha RK, Gass A, Geurts JJ, Kragt J, Sombekke M, Vrenken H, Qualley P, et al. (2009) Genome-wide association analysis of susceptibility and clinical phenotype in multiple sclerosis. Hum Mol Genet 18:767-778. Becker KG, Simon RM, Bailey-Wilson JE, Freidlin B, Biddison WE, McFarland HF, Trent JM (1998) Clustering of non-major histocompatibility complex susceptibility candidate loci in human autoimmune diseases. Proc Natl Acad Sci U S A 95:9979-9984. Bhatti MT, Newman NJ (1999) A multiple sclerosis-like illness in a man harboring the mtDNA 14484 mutation. J Neuroophthalmol 19:28-33. Booth DR, Arthur AT, Teutsch SM, Bye C, Rubio J, Armati PJ, Pollard JD, Heard RN, Stewart GJ, Southern MSGC (2005) Gene expression and genotyping studies implicate the interleukin 7 receptor in the pathogenesis of primary progressive multiple sclerosis. J Mol Med 83:822-830. Buhmann C, Gbadamosi J, Heesen C (2002) Visual recovery in a man with the rare combination of mtDNA 11778 LHON mutation and a MS-like disease after mitoxantrone therapy. Acta Neurol Scand 106:236-239. Cavanillas ML, Alcina A, Nunez C, de las Heras V, Fernandez-Arquero M, Bartolome M, de la Concha EG, Fernandez O, Arroyo R, Matesanz F, Urcelay E (2010) Polymorphisms in the IL2, IL2RA and IL2RB genes in multiple sclerosis risk. Eur J Hum Genet 18:794-799. Compston A, Coles A (2008) Multiple sclerosis. Lancet 372:1502-1517. D′Netto MJ, Ward H, Morrison KM, Ramagopalan SV, Dyment DA, DeLuca GC, Handunnetthi L, Sadovnick AD, Ebers GC (2009) Risk alleles for multiple sclerosis in multiplex families. Neurology 72:1984-1988. De Jager PL, Baecher-Allan C, Maier LM, Arthur AT, Ottoboni L, Barcellos L, McCauley JL, Sawcer S, Goris A, Saarela J, Yelensky R, Price A, Leppa V, Patterson N, de Bakker PI, Tran D, Aubin C, Pobywajlo S, Rossin E, Hu X, et al. (2009) The role of the CD58 locus in multiple sclerosis. Proc Natl Acad Sci U S A 106:5264-5269. Deckert M, Kubar J, Bernard A (1992) CD58 and CD59 molecules exhibit potentializing effects in T cell adhesion and activation. J Immunol 148:672-677. Dyment DA, Yee IM, Ebers GC, Sadovnick AD, Canadian Collaborative Study G (2006) Multiple sclerosis in stepsiblings: recurrence risk and ascertainment. J Neurol Neurosurg Psychiatry 77:258-259. Ebers GC, Sadovnick AD, Risch NJ (1995) A genetic basis for familial aggregation in multiple sclerosis. Canadian Collaborative Study Group. Nature 377:150-151. Ebers GC, Sadovnick AD, Dyment DA, Yee IM, Willer CJ, Risch N (2004) Parent-of-origin effect in multiple sclerosis: observations in half-siblings. Lancet 363:1773-1774. Farjam M, Zhang GX, Ciric B, Rostami A (2015) Emerging immunopharmacological targets in multiple sclerosis. J Neurol Sci 358:22-30. Flanigan KM, Johns DR (1993) Association of the 11778 mitochondrial DNA mutation and demyelinating disease. Neurology 43:2720-2722. Florez JC, Hirschhorn J, Altshuler D (2003) The inherited basis of diabetes mellitus: implications for the genetic analysis of complex traits. Annu Rev Genomics Hum Genet 4:257-291. Fry TJ, Mackall CL (2002) Interleukin-7: from bench to clinic. Blood 99:3892-3904. Gillis S, Smith KA (1977) Long term culture of tumour-specific cytotoxic T cells. Nature 268:154-156. Gordon J, MacLean LD (1965) A lymphocyte-stimulating factor produced in vitro. Nature 208:795-796. Goris A, Pauwels I, Dubois B (2012) Progress in multiple sclerosis genetics. Curr Genomics 13:646-663. Gregory SG, Schmidt S, Seth P, Oksenberg JR, Hart J, Prokop A, Caillier SJ, Ban M, Goris A, Barcellos LF, Lincoln R, McCauley JL, Sawcer SJ, Compston DA, Dubois B, Hauser SL, Garcia-Blanco MA, Pericak-Vance MA, Haines JL; Multiple Sclerosis Genetics Group (2007) Interleukin 7 receptor alpha chain (IL7R) shows allelic and functional association with multiple sclerosis. Nat Genet 39:1083-1091. Hafler DA, Compston A, Sawcer S, Lander ES, Daly MJ, De Jager PL, de Bakker PI, Gabriel SB, Mirel DB, Ivinson AJ, Pericak-Vance MA, Gregory SG, Rioux JD, McCauley JL, Haines JL, Barcellos LF, Cree B, Oksenberg JR, Hauser SL (2007) Risk alleles for multiple sclerosis identified by a genomewide study. N Engl J Med 357:851-862. Haj MS, Nikravesh A, Kakhki MP, Rakhshi N (2015) Association study of four polymorphisms in the interleukin-7 receptor alpha gene with multiple sclerosis in Eastern Iran. Iran J Basic Med Sci 18:593-598. Hauser SL, Oksenberg JR (2006) The neurobiology of multiple sclerosis: genes, inflammation, and neurodegeneration. Neuron 52:61-76. Hecker M, Blaschke J, Blaschke P, Fitzner B, Koczan D, Thiesen H-J, Zettl U (2014) CD58 and multiple sclerosis: genetic association, gene expression and prognostic value (P6.156). Neurology 82:P6.156-. Hoffjan S, Akkad DA (2010) The genetics of multiple sclerosis: an update 2010. Mol Cell Probes 24:237-243. Hofmeister R, Khaled AR, Benbernou N, Rajnavolgyi E, Muegge K, Durum SK (1999) Interleukin-7: physiological roles and mechanisms of action. Cytokine Growth Factor Rev 10:41-60. Hoppenbrouwers IA, Aulchenko YS, Janssens AC, Ramagopalan SV, Broer L, Kayser M, Ebers GC, Oostra BA, van Duijn CM, Hintzen RQ (2009) Replication of CD58 and CLEC16A as genome-wide significant risk genes for multiple sclerosis. J Hum Genet 54:676-680. Housley WJ, Pitt D, Hafler DA (2015) Biomarkers in multiple sclerosis. Clin Immunol 161:51-58. Ingram G, Hakobyan S, Robertson NP, Morgan BP (2009) Complement in multiple sclerosis: its role in disease and potential as a biomarker. Clin Exp Immunol 155:128-139.
International Multiple Sclerosis Genetics Consortium; Wellcome Trust Case Control Consortium 2, Sawcer S, Hellenthal G, Pirinen M, Spencer CC, Patsopoulos NA, Moutsianas L, Dilthey A, Su Z, Freeman C, Hunt SE, Edkins S, Gray E, Booth DR, Potter SC, Goris A, Band G, Oturai AB, Strange A, et al. (2011) Genetic risk and a primary role for cell-mediated immune mechanisms in multiple sclerosis. Nature 476:214-219. Jamrozik Z, Tutaj A, Piechowski-Jozwiak B, Mroczek-Tonska K, Bartnik E, Kwiecinski H (2003) Leber′s hereditary optic neuropathy (LHON) with mutation at G3460A and MS-like phenotype. Neurol Neurochir Pol 37:713-720. Jansen PH, van der Knaap MS, de Coo IF (1996) Leber′s hereditary optic neuropathy with the 11778 mtDNA mutation and white matter disease resembling multiple sclerosis: clinical, MRI and MRS findings. J Neurol Sci 135:176-180. Kallio SP, Jakkula E, Purcell S, Suvela M, Koivisto K, Tienari PJ, Elovaara I, Pirttilä T, Reunanen M, Bronnikov D, Viander M, Meri S, Hillert J, Lundmark F, Harbo HF, Lorentzen AR, De Jager PL, Daly MJ, Hafler DA, Palotie A, et al. (2009) Use of a genetic isolate to identify rare disease variants: C7 on 5p associated with MS. Hum Mol Genet 18:1670-1683. Kalman B, Mandler RN (2002) Studies of mitochondrial DNA in Devic′s disease revealed no pathogenic mutations, but polymorphisms also found in association with multiple sclerosis. Ann Neurol 51:661-662. Kalman B, Lublin FD, Alder H (1995) Mitochondrial DNA mutations in multiple sclerosis. Multiple Sclerosis 1:32-36. Kalman B, Lublin FD, Alder H (1996) Characterization of the mitochondrial DNA in patients with multiple sclerosis. J Neurol Sci 140:75-84. Kalman B, Li S, Chatterjee D, O′Connor J, Voehl MR, Brown MD, Alder H (1999) Large scale screening of the mitochondrial DNA reveals no pathogenic mutations but a haplotype associated with multiple sclerosis in Caucasians. Acta Neurol Scand 99:16-25. Kasakura S, Lowenstein L (1965) A factor stimulating DNA synthesis derived from the medium of leukocyte cultures. Nature 208:794-795. Kemppinen A, Sawcer S, Compston A (2011) Genome-wide association studies in multiple sclerosis: lessons and future prospects. Brief Funct Genomics 10:61-70. Keogh MJ, Chinnery PF (2015) Mitochondrial DNA mutations in neurodegeneration. Biochim Biophys Acta 1847:1401-1411. La Russa A, Cittadella R, Andreoli V, Valentino P, Trecroci F, Caracciolo M, Gallo O, Gambardella A, Quattrone A (2011) Leber′s hereditary optic neuropathy associated with a multiple-sclerosis-like picture in a man. Multiple Sclerosis 17:763-766. Malek TR (2008) The biology of interleukin-2. Annu Rev Immunol 26:453-479. Mao P, Reddy PH (2010) Is multiple sclerosis a mitochondrial disease? Biochim Biophys Acta 1802:66-79. Mayr-Wohlfart U, Paulus C, Henneberg A, Rodel G (1996) Mitochondrial DNA mutations in multiple sclerosis patients with severe optic involvement. Acta Neurol Scand 94:167-171. Mihailova SM, Ivanova MI, Quin LM, Naumova EJ (2007) Mitochondrial DNA variants in Bulgarian patients affected by multiple sclerosis. Eur J Neurol 14:44-47. Morgan DA, Ruscetti FW, Gallo R (1976) Selective in vitro growth of T lymphocytes from normal human bone marrows. Science 193:1007-1008. Ogura Y, Bonen DK, Inohara N, Nicolae DL, Chen FF, Ramos R, Britton H, Moran T, Karaliuskas R, Duerr RH, Achkar JP, Brant SR, Bayless TM, Kirschner BS, Hanauer SB, Nunez G, Cho JH (2001) A frameshift mutation in NOD2 associated with susceptibility to Crohn′s disease. Nature 411:603-606. Oksenberg JR, Baranzini SE, Barcellos LF, Hauser SL (2001) Multiple sclerosis: genomic rewards. J Neuroimmunol 113:171-184. Olsen NK, Hansen AW, Norby S, Edal AL, Jorgensen JR, Rosenberg T (1995) Leber′s hereditary optic neuropathy associated with a disorder indistinguishable from multiple sclerosis in a male harbouring the mitochondrial DNA 11778 mutation. Acta Neurol Scand 91:326-329. Parry-Jones AR, Mitchell JD, Gunarwardena WJ, Shaunak S (2008) Leber′s hereditary optic neuropathy associated with multiple sclerosis: Harding′s syndrome. Pract Neurol 8:118-121. Patsopoulos NA1; Bayer Pharma MS Genetics Working Group; Steering Committees of Studies Evaluating IFNβ-1b and a CCR1-Antagonist; ANZgene Consortium; GeneMSA; International Multiple Sclerosis Genetics Consortium, Esposito F, Reischl J, Lehr S, Bauer D, Heubach J, Sandbrink R, Pohl C, Edan G, Kappos L, Miller D, Montalbán J, Polman CH, Freedman MS, Hartung HP, et al. (2011) Genome-wide meta-analysis identifies novel multiple sclerosis susceptibility loci. Ann Neurol 70:897-912. Penisson-Besnier I, Moreau C, Jacques C, Roger JC, Dubas F, Reynier P (2001) Multiple sclerosis and Leber′s hereditary optic neuropathy mitochondrial DNA mutations. Rev Neurol 157:537-541. Perera D, Stankovich J, Butzkueven H, Taylor BV, Foote SJ, Kilpatrick TJ, Rubio JP (2009) Fine mapping of multiple sclerosis susceptibility genes provides evidence of allelic heterogeneity at the IL2RA locus. J Neuroimmunol 211:105-109. Poursadegh Zonouzi A, Ghorbian S, Abkar M, Poursadegh Zonouzi AA, Azadi A (2014) Mitochondrial complex I gene variations; as a potential genetic risk factor in pathogenesis of multiple sclerosis. J Neurol Sci 345:220-223. Prokunina L, Castillejo-López C, Oberg F, Gunnarsson I, Berg L, Magnusson V, Brookes AJ, Tentler D, Kristjansdóttir H, Gröndal G, Bolstad AI, Svenungsson E, Lundberg I, Sturfelt G, Jönssen A, Truedsson L, Lima G, Alcocer-Varela J, Jonsson R, Gyllensten UB, et al. (2002) A regulatory polymorphism in PDCD1 is associated with susceptibility to systemic lupus erythematosus in humans. Nat Genet 32:666-669. Ramagopalan SV, Anderson C, Sadovnick AD, Ebers GC (2007) Genomewide study of multiple sclerosis. N Engl J Med 357:2199-2200; author reply 2200-2191. Raphael I, Webb J, Stuve O, Haskins W, Forsthuber T (2015) Body fluid biomarkers in multiple sclerosis: how far we have come and how they could affect the clinic now and in the future. Expert Rev Clin Immunol 11:69-91. Rubio JP, Stankovich J, Field J, Tubridy N, Marriott M, Chapman C, Bahlo M, Perera D, Johnson LJ, Tait BD, Varney MD, Speed TP, Taylor BV, Foote SJ, Butzkueven H, Kilpatrick TJ (2008) Replication of KIAA0350, IL2RA, RPL5 and CD58 as multiple sclerosis susceptibility genes in Australians. Genes Immun 9:624-630. Ruiz-Pesini E, Lott MT, Procaccio V, Poole JC, Brandon MC, Mishmar D, Yi C, Kreuziger J, Baldi P, Wallace DC (2007) An enhanced MITOMAP with a global mtDNA mutational phylogeny. Nucleic Acids Res 35:D823-828. Sombekke MH, van der Voort LF, Kragt JJ, Nielsen JM, Guzel H, Visser A, Oudejans CB, Crusius JB, Pena AS, Vrenken H, Polman CH, Killestein J (2011) Relevance of IL7R genotype and mRNA expression in Dutch patients with multiple sclerosis. Multiple Sclerosis 17:922-930. Taylor RW, Chinnery PF, Bates MJ, Jackson MJ, Johnson MA, Andrews RM, Turnbull DM (1998) A novel mitochondrial DNA point mutation in the tRNA(Ile) gene: studies in a patient presenting with chronic progressive external ophthalmoplegia and multiple sclerosis. Biochem Biophys Res Commun 243:47-51. Teutsch SM, Booth DR, Bennetts BH, Heard RN, Stewart GJ (2003) Identification of 11 novel and common single nucleotide polymorphisms in the interleukin-7 receptor-alpha gene and their associations with multiple sclerosis. Eur J Hum Genet 11:509-515. Torbati S, Karami F, Ghaffarpour M, Zamani M (2015) Association of CD58 polymorphism with multiple sclerosis and response to interferon ss therapy in a subset of iranian population. Cell J 16:506-513. Torroni A, Huoponen K, Francalacci P, Petrozzi M, Morelli L, Scozzari R, Obinu D, Savontaus ML, Wallace DC (1996) Classification of European mtDNAs from an analysis of three European populations. Genetics 144:1835-1850. Tran M, Bhargava R, MacDonald IM (2001) Leber hereditary optic neuropathy, progressive visual loss, and multiple-sclerosis-like symptoms. Am J Ophthalmol 132:591-593. Van Rhijn I, Van den Berg LH, Bosboom WM, Otten HG, Logtenberg T (2000) Expression of accessory molecules for T-cell activation in peripheral nerve of patients with CIDP and vasculitic neuropathy. Brain 123(Pt 10):2020-2029. Vogler S, Goedde R, Miterski B, Gold R, Kroner A, Koczan D, Zettl UK, Rieckmann P, Epplen JT, Ibrahim SM (2005) Association of a common polymorphism in the promoter of UCP2 with susceptibility to multiple sclerosis. J Mol Med 83:806-811. Vyshkina T, Sylvester A, Sadiq S, Bonilla E, Canter JA, Perl A, Kalman B (2008) Association of common mitochondrial DNA variants with multiple sclerosis and systemic lupus erythematosus. Clin Immunol 129:31-35. Wang JH, Smolyar A, Tan K, Liu JH, Kim M, Sun ZY, Wagner G, Reinherz EL (1999) Structure of a heterophilic adhesion complex between the human CD2 and CD58 (LFA-3) counterreceptors. Cell 97:791-803. Wang X, Lupardus P, Laporte SL, Garcia KC (2009) Structural biology of shared cytokine receptors. Ann Rev Immunol 27:29-60. Weber F, Fontaine B, Cournu-Rebeix I, Kroner A, Knop M, Lutz S, Müller-Sarnowski F, Uhr M, Bettecken T, Kohli M, Ripke S, Ising M, Rieckmann P, Brassat D, Semana G, Babron MC, Mrejen S, Gout C, Lyon-Caen O, Yaouanq J, et al. (2008) IL2RA and IL7RA genes confer susceptibility for multiple sclerosis in two independent European populations. Genes Immun 9:259-263. Wiesner RJ, Ruegg JC, Morano I (1992) Counting target molecules by exponential polymerase chain reaction: copy number of mitochondrial DNA in rat tissues. Biochem Biophys Res Commun 183:553-559. Witte ME, Mahad DJ, Lassmann H, van Horssen J (2014) Mitochondrial dysfunction contributes to neurodegeneration in multiple sclerosis. Trends Mol Med 20:179-187. Zhang Z, Duvefelt K, Svensson F, Masterman T, Jonasdottir G, Salter H, Emahazion T, Hellgren D, Falk G, Olsson T, Hillert J, Anvret M (2005) Two genes encoding immune-regulatory molecules (LAG3 and IL7R) confer susceptibility to multiple sclerosis. Genes Immun 6:145-152. 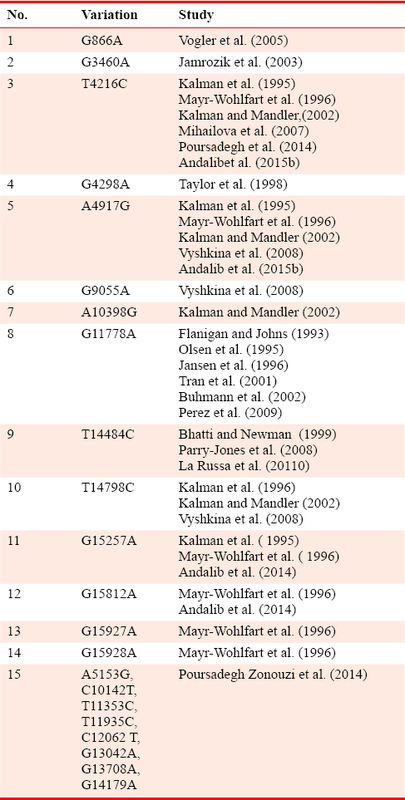 Zuvich RL, McCauley JL, Oksenberg JR, Sawcer SJ, De Jager PL, International Multiple Sclerosis Genetics C, Aubin C, Cross AH, Piccio L, Aggarwal NT, Evans D, Hafler DA, Compston A, Hauser SL, Pericak-Vance MA, Haines JL (2010) Genetic variation in the IL7RA/IL7 pathway increases multiple sclerosis susceptibility. Hum Genet 127:525-535.